Hale's Joseph Kimmerer hugs his grandpa after reaching 1,000 career points as a junior against Au Gres-Sims. HALE, MICH. — The Hale Eagles boys squad took to court for a special night, but if you ask junior guard Joseph Kimmerer it’s another night trying to get a win for the team. Kimmerer entered Friday’s matchup against Au Gres-Sims seven points away from 1,000 career points. Four other student athletes have reached this milestone this season: Taylor Fleming (Rogers City), Katelyn Etherton (Oscoda), Brooke Ciarkowski (Posen) and Tyson Claeys (Johannesburg-Lewiston). Kimmerer averages about 25 points per game. The junior waited till 5:13 left in the first quarter to knock down his first points of the game on a three-pointer. Then less than four minutes to go he snagged a rebound for the putback just two points to go. With 42.6 seconds left in the quarter, Kimmerer drove down the baseline, scored and made history reaching 1,000 career points. 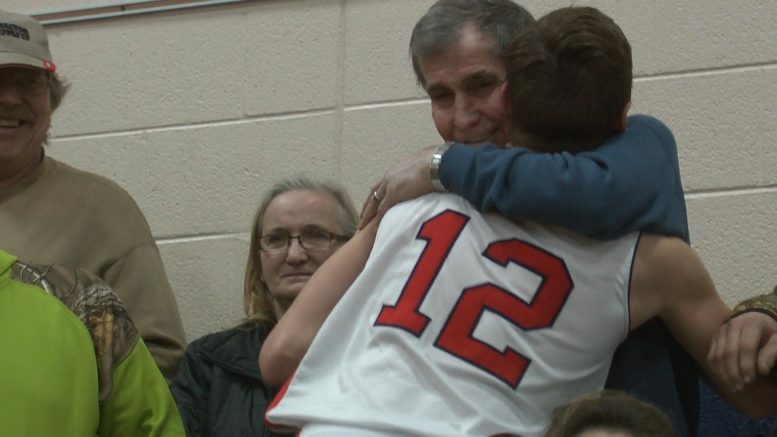 His teammates surrounded him and then his father and coach, Joe Kimmerer II, gave his son the 1,000 point ball. As soon as Joseph got the ball he walked up the bleachers and gave it to his grandpa. The Kimmerer’s have a lot of history at Hale High School. Joseph Kimmerer I taught his son and grandson in 7th and 8th grade during his 35 years coaching at Hale. He started coaching varsity football for four years in 1983, then moved on to boys and girls basketball. Then Kimmerer II continued the family coaching tradition, taking over varsity boys basketball. As a Hale athlete, Kimmerer II also reached the 1,000 point milestone. After the first, Au Gres-Sims closed the gap and tied the game up at 42-all in the fourth. Wolverines big man Isaac Beardley fouled out and Kimmerer knocked down his free throws to seal the deal for Hale 54-49 improving to (11-4) overall and (8-3) in the Big North Conference-Big Dipper holding on to the top spot over Posen. The varsity girls took the court before the boys for another dog fight. Michigan top 100 Hale athlete Olivia Rasch scored off a turnover, tying the game up at 42-all. Au Gres-Sims’ Kennadi Zeien knocked down nine of her 16 points in the fourth, but it was not enough. The Eagle’s Brooke Pelton made a go-ahead three-pointer helping Hale defeat Au Gres-Sims 51-49.